Some of us are content showing our fan flair for Overwatch with a cute D.VA headset and a pair of Mei slippers - but 3D artist Joshua Llorente created a whole map for the game. The Cairo-inspired masterpiece is so impressive that it even won over Overwatch director Jeff Kaplan. Llorente is from the Philippines and is currently studying for a Bachelor of Fine Arts major in Advertising Arts, and made the map in his free time. "This map took me about 2 months to finish, since I'm doing this together with my college thesis," says Llorente. "I guess I'm doing this because I'm enjoying it, it's like I'm also playing a game." In the past he's also made level designs inspired by other Overwatch locations like Luxor, Vishkar Labs, and Manila. Llorente posted the work on Reddit, and actually got a response from Kaplan. "Amazing work! We'll be in touch." It feels as though an internship (at the very least) at Blizzard could be in the works, even if this amazing payload map doesn't ever really make it into the game. 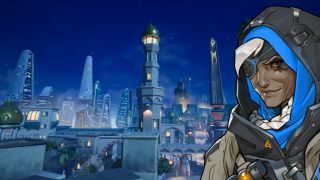 The Overwatch development team, and Kaplan in particular, pays particular attention to what the passionate community is up to. "I love being held to high expectations. And part of the thrill of what we do is trying to meet them," Kaplan says in an interview with Waypoint. "I know we won't always meet them, but I think that the type of developer that's attracted to be at a place like Blizzard wants that challenge, and wants to try to make the best thing possible. We think it's totally fair that people criticize us - it just spurs us to do a better job next time."